When I was a little girl, my mother took me to Europe, just the two of us, for a special mother-daughter experience. We stopped in Paris, which is undoubtedly one of the most magical cities in the world. We saw the Mona Lisa at the Louvre, walked up and down the Champs Elysee, witnessed the elegant style of Parisian women and were introduced to Nutella. We didn't eat a lot of sweets in our house growing up, so being allowed to enjoy this heavenly chocolate hazelnut spread on vacation with my mom was an irresistible, special treat. I don't buy Nutella very often. If I did, the kids would get so obsessed they’d probably ask me to bathe them in it. So when I do use it, my family knows it’s a special occasion. In these pancakes, the addition of Nutella takes them from good to unbelievably scrumptious. They’re obviously aren't on the every day rotation of breakfast items in our house, but when I do make these pancakes, the experience of eating them reminds me of a spectacular culinary adventure enjoyed with my mom. Why not try them this Valentine’s Day for breakfast? The kids and my hubby are waking up to them for sure! 1. Whisk the first 3 ingredients in a bowl. 2. In a separate bowl whisk the Nutella, egg and sugar until combined, then whisk in the milk until incorporated. 3. Whisk the wet ingredients into the dry ingredients until just combined (it’s ok if there are a few lumps). 4. Heat a large sauté pan or griddle over medium heat and grease with oil. 5. Pour about 1/4 cup of the pancake mixture onto the griddle and cook for 2-3 minutes on each side. 6. Serve with raspberry sauce. * You can keep pancakes warm on a sheet tray in a 250 degree oven until all the pancakes are cooked. Awesome! I am making this for my LO tom morning! Does this freeze well? Although Nutella is delicious, it also contains the artificial flavor vanillin. It would be better to use an all natural hazelnut chocolate spread rather than expose your child to an artificial ingredient (even if it is infrequent). Love this recipe and nutella! I can't wait to try it out. I love this site and every recipe I've tried from it. Keep them coming! This is too funny! I made crepes with raspberry puree (left from last summer in the freezer), Nutella and whip cream for my girls this morning, then I saw this recipe. How coincidental! Love your site and ideas, keep 'em coming! i love this site , i check it once a day. Nothing irritates me more than when people have to comment about the once in a blue moon recipes contain too much sugar or ::gasp:: white flour or this ingrediant or that..
Just substitute people! occasional treats are fine, esp. if they are homemade. it's better than buying the processed junk that is sold in stores. I had no idea that MaraNatha made a chocolate hazelnut spread! My son really likes Nutella as a special treat since he was introduced to it at school in French class, but I'll feel much better knowing it's more natural. Thanks for the tip, I'm going to check it out. I can't wait to make these, and I can't imagine what you are going to come up with next! I seem to love everything you make. Keep 'em coming, and happy Love Day! If Nutella's in the house I'm in the pantry with a spoon in my hand, for more than one scoop, that's for sure. It's so yummy! But, I am happy to hear about the MaraNatha option. Gotta try this recipe. Made these this morning and they are sooo good!! They look yummy. I will make these for my boys for Pancake Day at the beginning of March. We holiday in France every year and Nutella is a favourite. Although I don't think a little Nutella every once in while will hurt anyone, I really appreciate the suggestions for alternatives that don't contain van1llin. I'm definitely making these pancakes! My kids are going to flip! I just came back to your bake sale post last night to get some inspiration for ceoikos to send Nick at college. A fabulous resource! These ceoikos would be perfect, too YUM! The only ingredients are: peanuts, evaporated cane juice, cocoa, cocoa butter, palm fruit oil, vanilla, lecithin (from sunflowers), and salt. I know there may be concerns about the effects on the local communities to harvesing palm oil and it doesn't say the cocoa is from free trade cocoa beans, so I am going to assume they are not, but it is still better than nutella where the first ingredient is sugar. If it is a concern for you PB &amp; co. is a member of Green Palm, which offers a certificate trading program designed to tackle environmental and social problems created by the production of palm oil. Under this program, they are able to reward palm oil producers by paying them for an equivalent amount of palm oil that they have produced sustainably and responsibly. Also, even thought the first ingredient is peanuts, the cocoa flavor is definitely predominant. BTW, Nutella's ingredients are: sugar, palm oil, hazelnuts, cocoa, skim milk, reduced minerals whey (milk), lecithin as emulsifier (soy), vanillin: an artificial flavor. Thanks Mara! I thought it was Italian too. I studied abroad in Italy and EVERYTHING has hazelnuts in it...so much so that I can barely tolerate the smell of nutela. My kids love it though, so I buy it! Taking one for the team. These pancakes were delicious! I agree much healthier than the frozen store bought pancakes that many kids eat! Thanks! We tried these pancakes last weekend and loved it! We loved the texture of the pancakes. It was a fun treat for the family. I'm definitely going to check out the tips for homemade nutella for a more natural version. I'm all about homemade! Thanks! yup :) that would be fine. You can use any kind of berry. I made these this morning, huge hit! I had a very ripe banana hanging around so I threw that in, was delicious. Didn't have any raspberries so I served them with vanilla yogurt &amp; fresh strawberries. Thanks for the fabulous start to our Sunday! here's to hoping I can scrape out 1/4 cup of nutella out of the container Monday morning lol. Can you use fresh raspberries? If so, do you make it the same way? If you want an all natural Nutella check-out Nut-Tritious Foods Hazelnut &amp; Chocolate blend. It's first ingredient is fresh roasted hazelnuts and made with sunflower seeds, organic flax seed meal, 87% dark cocoa powder and organic agave nectar. Better than the chocolate crisco blend - and good for you !!! You're definitely kliilng me with this bread! My mom used to make pull apart breads and they were my favorites not because of the taste, but because they are SO much fun to eat! So take pull apart bread and add garlic and chives and what do you have? A fun and heavenly delight! These are delicious! Just made these to freeze. The kids love them. They'll be perfect to just pop in the microwave for breakfast when school starts next week. BTW, love your website. Have you tried this recipe with whole wheat flour? I make most everything I bake with white whole wheat flour, including this recipe and I think it tastes just fine. 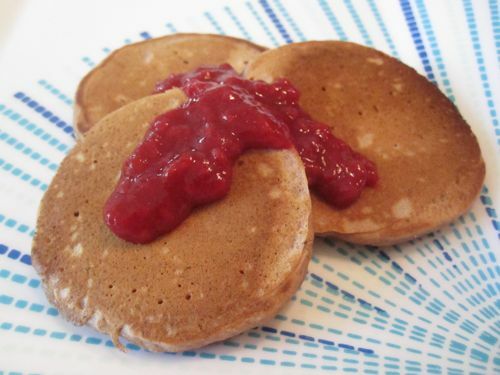 My kids love these pancakes...I make them as a treat once in a while. They seriously smell like cookies baking, not pancakes! Before I finally deiecdd to go back on WW I had bought a double pack of Nutella from Costco! 1 1/4 jars left so I am going to save your recipe for a time when I can better deal with being around this cake and then will make it for work! Looks absolutely YUMMY!!! My kids devoured this, my older toddler was feeling a little low with a runny nose, and his face lighted up when he got the aromas from breakfast =). Both loved it, and me too.